A weekend excursion to visit traditional Christmas Markets presents us with an opportunity to send a little holiday cheer from across the pond. While exploring “old town” Salzburg, we came across the local carriage concession. This cute pair of Haflingers caught my eye and soon we were enjoying a horse drawn tour of this beautiful city. Commercial carriage horses need to be flawless under pressure. These two mares were an excellent team- driven without blinkers or the use of a whip, they were none the less unflinching. This, despite some parts of our ride being in heavy car and truck traffic. 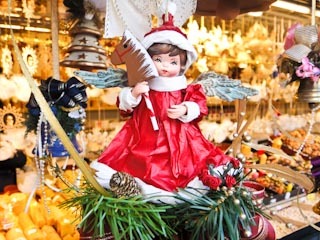 A light snow was falling as we passed through the holiday markets in our open Vis-à-Vis; truly magic. “Salzburg” translates as “salt castle” and for centuries the local salt mines provided this area with vast wealth; enough to build the biggest medieval castle in Europe, a castle which still stands guard over the city. The 18th century composer Wolfgang Amadeus Mozart was born here and is the city’s favorite son but this is an ancient place. When Mozart himself walked these streets, he was living in a city that was already 1000 years old. World War II bombing raids destroyed much of Salzburg but thankfully missed the bulk of its historic center. Today it’s a Unesco World Heritage Site and considered one of the best preserved examples of Baroque architecture in Europe. 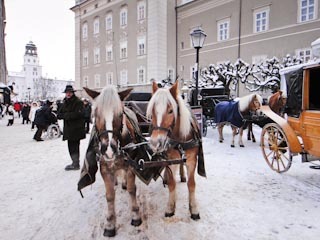 A carriage tour is a nice way to experience any historic city. From inside a carriage, visitors can appreciate the town from the same perspective as the people who lived their centuries ago. Carriage concessions are a favorite target of animal rights activists and it’s a shame. Everyone needs a way to earn an honest living after all, even a nice team of Haflinger ponies. So the next time you come across a carriage ride operator, consider giving them some business and enjoy the ride. From all of us here at High Minded Horseman- Merry Christmas! And a very Happy New Year!